On the 9th October a young dog was hit by a car. A rescue group - H.A.A.R.T (Homeless and Abused Animal Rescue Team) - was called and they started the process of recruiting donors to help pay for the surgery needed to save his life. The vet estimated that about $2,000 would be needed for the surgery. The donation callout was successful and the treatment went ahead. H.A.A.R.T thanked their supporters later that day, giving an update on his condition and advising that his new name would be "Benedict" or Benny for short. By the 11th October Benny was starting to feel a lot better. He was even getting around. It was decided that he would spend his time in foster with one of the vet nurses at the surgery caring for him. A week later, it was decided that his wound should be reopened and drained. By early November, he has woo'ed his foster carer, she 'foster failed' and decided to keep him. H.A.A.R.T again thanked their donors for their support. Take a boy like Benedict with seemingly no hope, unclaimed, scheduled for euthanasia and suffering from a terrible broken leg. Add a frantic rush around for rescue, an amazing response of donations from YOU and you have a super happy Benny Boy! Back in June of 2017, PetRescue ran its 'The Adoptables' campaign. During that campaign PetRescue got the feedback that maybe it shouldn't be collecting money for special needs pets, when it had no intention of giving money to those pets. Let's just say, a lot of feedback. In response,PetRescue dedicated one day - the final day - of fundraising to rescue groups. - $50,000 for vet work ($25k raised, $25 matched by Woolworths). This $50k was shared amongst a handful of groups who had given their stories to use in the solicitation. Silly rescue group runs out of money and leaves a pet at risk. PetRescue (and Woolworths) step in and save the day! Keep in mind Benny never featured or had a listing on PetRescue - he only attracted the eye of the organisation when they saw he had a compelling story to use to promote their relationship with Woolworths. When the rescue group who cared for Benny (H.A.A.R.T) was asked about the donation, they were upfront about PetRescue's actual level of involvement. 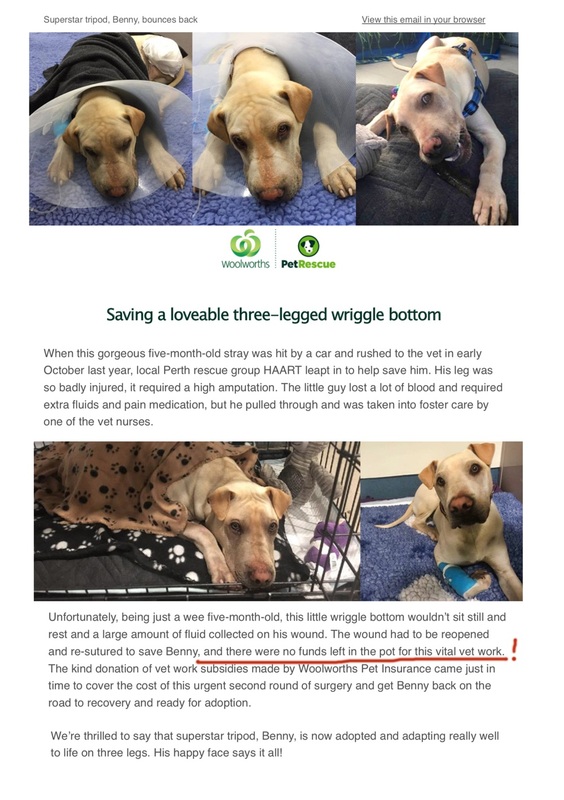 "Our wonderful supporters donated and raised the funds for Benny's initial amputation and meds... (PetRescue's) funds came in after Benny’s surgery. Obviously we (HARRT) would not have delayed anything he needed. The money received was NOT received specifically for Benny, just came in at an opportune time and so was used to pay for his second surgery. In short; the rescue group did all the rescue work and the rescue group's own supporters did all the heavy lifting donating funds. They saved Benny. At the same time, PetRescue had some money it needed to give away in response to criticism that it shouldn't be fundraising for animal care donations and gave a small amount to the groups who gave permission for their animals to used in the original solicitation as a make good. PetRescue then used this money again to extract permission to use a compelling story to use in its communications. Thanks to the generous support of Woolworths Pet Insurance in 2017, we were able to award thousands of dollars in donations direct to the rescue groups who participated in our tax time Adoptables campaign for senior and special needs pets. And thanks to Woolworths’ ongoing support as major partners of PetRescue, we’re able to continue creating positive outcomes for thousands of Australia’s rescue pets in foster care, shelters, pounds and forever homes! 'The Adoptables' isn't a "program" to distribute animal care donations to rescue groups - it is a way for PetRescue to earn nearly $200k for it's own use. And a popularity contest which keeps rescue groups compliant in sharing their stories, rescue cases, photos and adoption tales, lest they be excluded from receiving any money at all. There is no formal process, no transparency or fair terms rescue groups can reference - PetRescue is just playing fairy-godmother to their favourites, sprinkling money to those groups most willing to sing their praises. And in the process PetRescue are claiming they are the ones who 'saved' pets, that they literally played no role in saving. This is a bad deal for rescues. PetRescue doesn't rescue pets. It should not be taking animal care donations at all. And Woolworths should know they're caught up in a scam which is hurting rescue.